It seems as though it was just wishful thinking when Colin Montgomerie, speaking about a discussion he’d had with fellow Champions Tour players, revealed they’d thought Bernhard Langer could be “a shot-and-a-half a round worse off” as a result of the anchoring ban introduced at the start of the year. “He’s that bloody good, of course, that he will probably find a way to still get the ball in the hole,” added Montgomerie at the same time, in fairness, and it’s taken Langer just three events to prove his former Ryder Cup partner wrong on one count and right on the other. Set up by scintillating opening rounds of 62 and 66, the 58-year-old German won the Chubb Classic in Florida with a 15-under-par total, a 26th Champions Tour title hoisting him to third on the list behind Hale Irwin (45) and Lee Trevino (29). Apparently, Langer had 15 putters on the practice green during the event, so is not yet fully convinced about the slight change he’s been forced to make with his trusty broom-handled model but it’s still knocking in the putts. 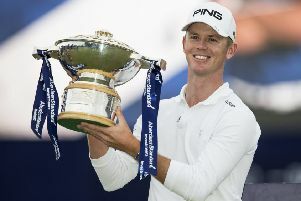 Ominous words early on in a season that sees the German return to Carnoustie, scene of his 2010 win in the same event, for the Senior Open Championship in July.